I love popsicles made with my Zoku popsicle maker -- and, this is an easy and super fast recipe -- Strawberry and Yogurt Smoothie Popsicle. Now that strawberry season is coming to a close in New York and Long Island, grab a quart at the farmers market and whip up a batch. 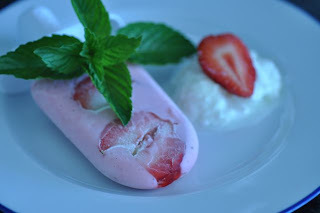 On a hot day, these are great for breakfast with a dollop of yogurt, cut strawberries and a sprig of fresh mint from the garden or a delicious and healthy treat after camp for kids. Add milk, strawberries and yogurt to a blender. Blend. 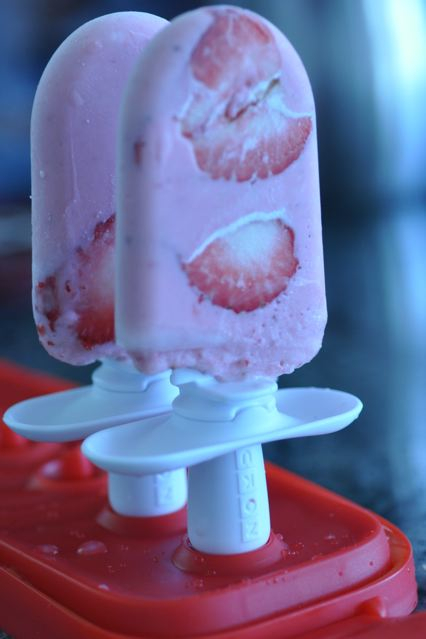 The ideal consistency for the Zoku or any other popsicle maker should be a pourable liquid similar to a smoothie. Taste and add honey a little at a time, if desired, for a sweeter pop. Fill popsicle molds -- start by placing fresh slices of strawberries on the outside wall of the mold for a decorative touch, then pour the smoothie into the mold according to the manufacturers instructions.